The Security Council unanimously voted on Wednesday in favour of deploying up to 75 observers to monitor a fragile ceasefire in Yemen's port city of Hudaydah which went into effect late last month; a lifeline for millions of Yemenis on the verge of starvation. Among other things, the newly adopted resolution establishes what will be officially known as the UN Mission to support the Hodeidah Agreement (UNMHA). 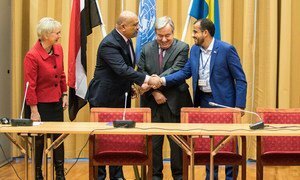 Last month, after UN-brokered consultations in Sweden aimed at getting the warring sides together to end nearly four years of brutal civil war, the Houthi movement leadership and Yemeni Government representatives, signed the Hodeidah Agreement. The resolution sets out, for an initial six months, an increase from around 20 observers already in place to monitor the ceasefire, up to 75, positioned in and around the Red Sea port, where Yemen’s receives most of its commercial goods and lifesaving aid. The new special political mission will support the implementation of the December Stockholm Agreement, consisting of three separate pledges between the two sides: halting hostilities in Hudaydah and mutually redeploying forces from the city and the ports, Salif and Ras Issa; a prisoner exchange mechanism; and a statement of understanding on the city of Taiz, where fighters have wrestled for control for years now. According to news reports, both Houthi rebels and the UN-backed Government have accused each other of multiple ceasefire breaches, calling the terms flawed because they lacked precision. Adding more monitors, will allow for more accurate assessment. Retired General Patrick Cammaert, chairs the Redeployment Coordination Committee (RCC), and in accordance with the Security Council resolution, will now head up UNMHA, reporting to the Secretary-General through Special Envoy for Yemen, Martin Griffiths. Monitor compliance to the ceasefire in Hodeidah governorate and the mutual redeployment of forces from the city of Hodeidah and the ports of Hodeidah, Salif and Ras Issa. Work with the parties to secure the city of Hodeidah and the ports of Hodeidah, Salif, and Ras Issa in accordance with Yemeni law. Facilitate and coordinate UN support to assist the parties to fully implement the Hodediah Agreement. The RCC includes Yemen government representatives and Houthis, to supervise implementation of the Stockholm Agreement. The UN advance team has already been working with the RCC on monitoring and supporting implementation. The UK-sponsored resolution requests the Secretary-General to report to the Council on a monthly basis on the resolution’s implementation and to present it with a review of UNMHA in five months’ time. The announcement of a ceasefire between Yemen’s warring parties in and around the key port of Hudaydah, was hailed by UN Secretary-General António Guterres on Thursday as a deal which would improve the lives of millions of people.